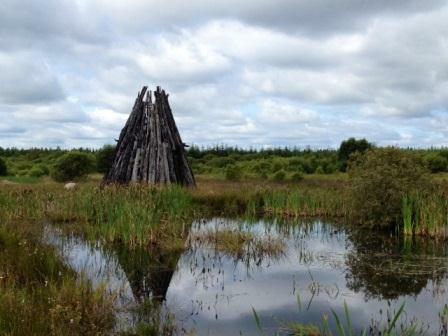 You cannot get more off the beaten track than at Lough Boora Sculpture Parklands in County Offaly. It is a peat bog (so expect flies) and a special area of conservation which apart from the designated walk/cycle ways is about as wild, natural and peaceful as you are likely to get anywhere in Ireland. Boglands were never particularly attractive before, smacking of hard, hot, sticky work, cutting, stacking and gathering of turf during the summer for winter fuel and largely neglected during the winter, apart from duck shooting on the many lakes and streams that characterize the Midlands. And yet evidence of human habitation has been found here in artifacts dating back to 6000 bc (the oldest in Ireland) And the bogs continue to give up their secrets with the discovery of the perfectly preserved human remains of Croghan Man, which you can see in the National Museum in Dublin as well as evidence of an ancient bog road at Corlea Trackway in Longford, which suggests nearby Clonmacnoise was the social hub of Mesolithic Ireland long before Christianity. For more information about bike hire call Pat 00353 86 8895194 although he is on site daily through the summer, he also sells cool drinks & snacks !